I have managed to see my fair share of radios with a retro twist and plenty of radios made for the outdoors, but I don’t believe I’ve ever seen one that actually combines the two. This Pure Oasis Flow does exactly that, it shows off great style while actually being capable of dealing with the weather outdoors. 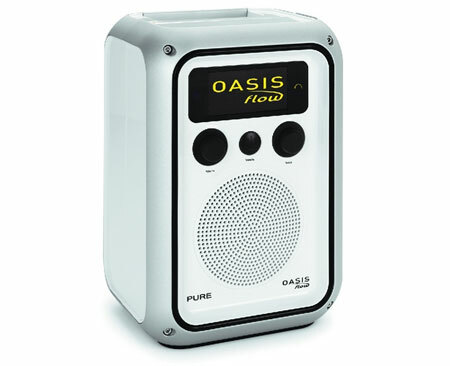 It also looks small enough that it would be a great sized radio to take with you to the beach. The radio is actually splash resistant thanks to the case, plus the rugged case is weatherproof as well. It has cast aluminum framework and rubber seals to finish off the deal. As far as the electronic portion goes it has internet radio, podcasts, PURE sounds and music streaming anywhere that you have a Wi-Fi connection. Plus it has your normal FM radio reception. As far as keeping it powered goes, the radio has a built-in rechargeable ChargePAK battery. You can’t purchase it just yet though, it’ll be released sometime in the first half of 2010. Sometime closer to the release date they’ll probably release the pricing information.